After a life changing trip to the birth place of Buddhism, we took the momentous decision to follow the religion. By “life-changing”, we mean having to shell out Rs. 25,000 for the last minute re-booking and by “follow” we mean literally follow the path the religion took as it expanded into south-east Asia. We decided to skip Sri Lanka for the moment (as time, tide and cheap hotel deals wait for no man, or woman) and hop onto Thailand where Buddhism finally reached around 600 AD and we in early 2018. It was also our first tryst with the Visa-on-Arrival and the whole thing went rather smoothly at the end - entire process taking just little over an hour or the time people spend staring at empty baggage carousels. Our trip started in the northern laid back university town of Chiang Mai which, for a tourist, is famous for its never ending array of esoteric temples. We started our day at the Wat Phra Singh which houses the city’s most revered Budhha statue and a golden chedi dating from 1345. Our temple hoping continued for rest of the day till we couldn’t hop anymore even if our lives depended on it. The sights that haven’t yet hopped off our memory are the picturesque 15th century chedi of Wat Chedi Luang, tower of receding spheres in Wat Ku Tao, the painted tunnels of Wat U-Mong and the Mahabodhi knock-off at the Wat Jed Yot. The pick of the lot was of course the glittering Wat Phra That Doi Suthep, dating from 1383 and not an inch of it spared from gold plating. 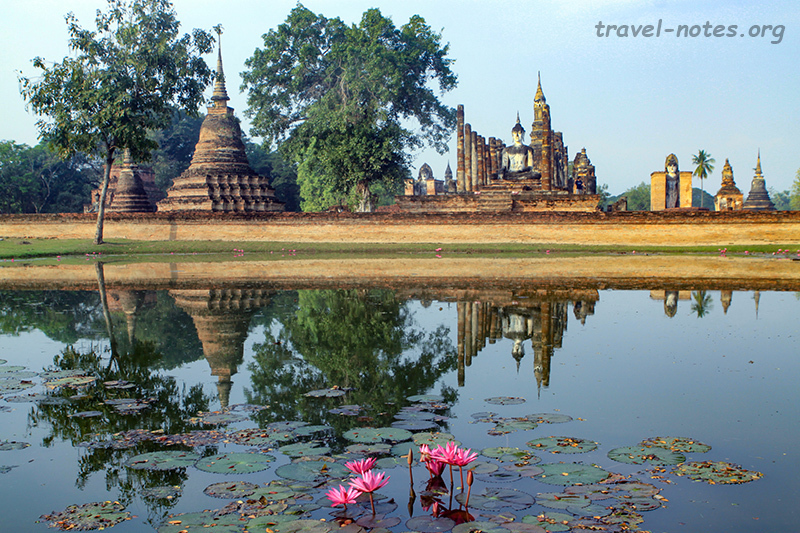 An hour south east of Chiang Mai is Lamphun, the capital of Haripunchai Kingdom - one of the oldest in Thailand. Its history dates back to at least the 6th century AD when it was ruled by the queen Chamadevi and a temple was erected here in her honour in the 13th century. It houses the quintessential example of Haripunchai architecture - the unique square chedi housing Buddha images in its niches. A copy of the chedi exists in the nearby Wat Phra That Haripunchai, somewhere hidden inconveniently behind the bigger and the more resplendent traditional chedi dating from the 9th century. Gaping at these chedis in Lamphun was one of the two breaks we had on the day long drive to Sukhothai. Sukhothai was born in late 1238 AD when a local chieftain managed to wiggle out of Khmer’s iron grip over the region and asserted his independence. Just as now, it was fashionable to trade your long local names to short Western ones and as America wasn’t yet discovered, he had to settle for Sanskrit. He changed his name from Pho Khun Bang Klang Hao to Sri Indraditya, the improvement in pronounceability noticed only by the Indians. His son was the famous Ram Khamhaeng, the ruler who is credited to have invented the modern Thai script. One of Sukhothai’s satellite towns, Si Satchanalai, was the other pit-stop for the day and it gave us an introduction to a Thai historic park – a sprawling site dotted with stunning ruins, large enough to guarantee solitude and at the same time small enough to cover on a bicycle. As we roamed around the site, we were as amazed by the ruins suddenly springing upon us as our body’s ability to balance a bicycle after 20 odd years of sitting inside a four-wheeler. In the hour we had in the park, we covered the highlights: Wat Phra Si Ratana Mahathat with its Khmer style chedi and a large walking Buddha statue that Sukhothai is famous for, Wat Nang Phaya with a Sinhalese style stupa and Wat Chang Lom with a large bell shaped stupa sitting on a base supported by elephant reliefs. All of the following day was spent at the Sukhothai Historical Park. If Si Satchanalai was stunning, Sukhothai completely swept us off our feat. This, after all, was the capital. The ruins here are in much better condition and very much more awe inspiring. To beat the crowd, we started off at the crowning glory of Sukhothai, Wat Mahathat, the largest temple in the ancient city housing most of the important Buddha images of Sukhothai. And view of the temple reflected on the serene waters of the surrounding lotus ponds was to die for. 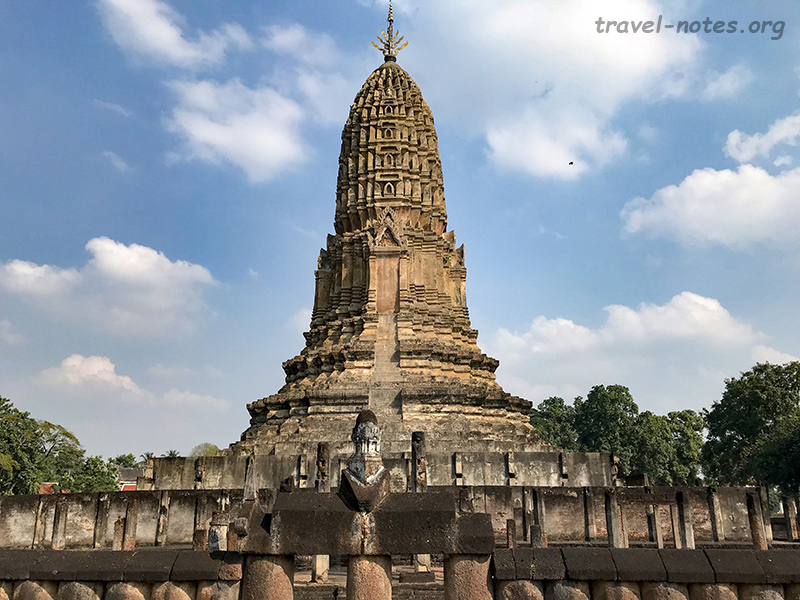 The core site of Sukhothai houses most of the important temples – Wat Si Sawai with the photogenic triplet of Khmer towers, Wat Sa Si and Wat Trapang Ngoen each with a serene Buddha statue in front of a classic Sukhothai chedi. However, the actual Sukhothai ruins are far more extensive covering an area of 36 sqkm and you need a cycle or a Tuk-Tuk to check out the outlying ruins. 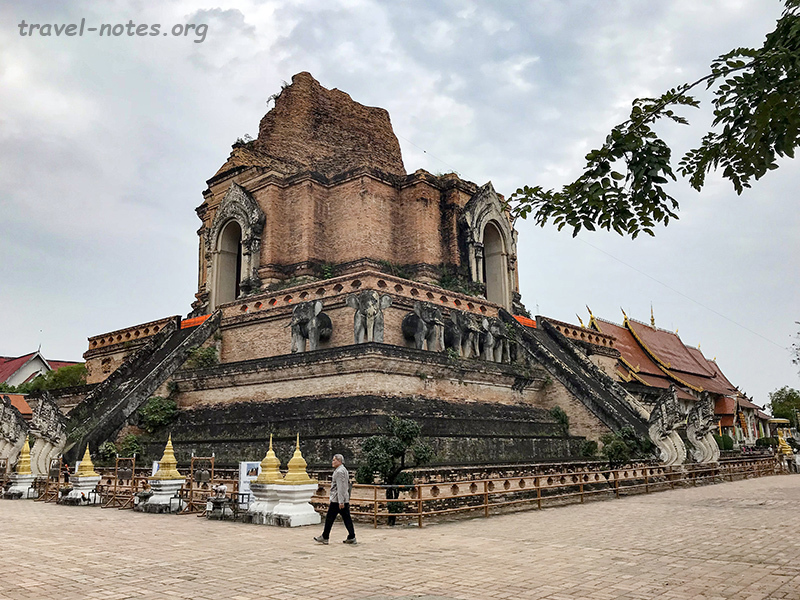 After checking out the core, we headed to the western section, pick of which lies at the far end of the long road – Wat Saphan Hin. A 6 km ride followed by a 200 m uphill hike brought us face to face (rather, face to ankle) with a 12.5 m tall Buddha statue enjoying one of the best views in the region. The nearby Wat Chedi Ngam, a well preserved bell-shaped chedi surrounded by thick green jungle deserves an honourable mention. All that huffing and puffing had made us ravishingly hungry. Finding a good restaurant was, as usual, the easy bit. The harder bit to communicate to the chef that we are vegetarians – that strange middle path chaps who don’t want any meat on their Pad thai, but dig the condensed milk in the Iced-tea. After the refueling stop, we headed to the northern section of the park which houses, in our opinion, the gem of Sukhothai – Wat Si Chum. A 15m tall brick and stucco Buddha sits inside a room that barely encloses it and your first sight of the statue is via a long slender opening in the front. As you walk towards the temple, the Petra like view grows on you and the immense size of the statue hits you like a thunderbolt the moment you cross into the building. And if you cannot picture this with this eloquent description of mine, go see it for yourself! The day that followed Sukhothai mirrored the day that preceded it – a long drive with two pit-stops. The first of these stops was at Kamphaeng Phet, another satellite town of Sukhothai and a fort that used to protect Sukhothai from the Burmese. When the Burmese eventually overran the city, Kamphaeng Phet bore the brunt and hence its monuments are in a less completed form than Sukhothai. That fact made this site different and not elicit unfavourable comparison with Sukhothai. The Buddha images here aren’t the compassionate smiling faces, but a weather worn human outline on a porous rock. If more lifelike images are your cup of tea, don’t fret – Kamphaeng Phet houses one of the signature Buddha images, a triplet of Buddha statues, two seated and one reclining, adorns its Wat Phra Kaew. The second stop of the day was at Lopaburi, another city dating from the first millennium AD, capital of the ancient Lavo Kingdom. The city gets its name from Lavapuri (present day Lahore) as it was founded by a king from Takshashila in 648 AD. Today’s Lopburi is home to Prang Sam Yot, a Khmer era temple with three interconnecting towers – an astonishing sight if you can keep your attention away from the marauding macaques, Phra Narai Ratchaniwet, a palace-museum housing the ruins from the palace complex of one of Thailand’s most famous kings – king Narai and Wat Phra Si Ratana Mahathat, a wonderful 13th century Khmer-era temple complex. 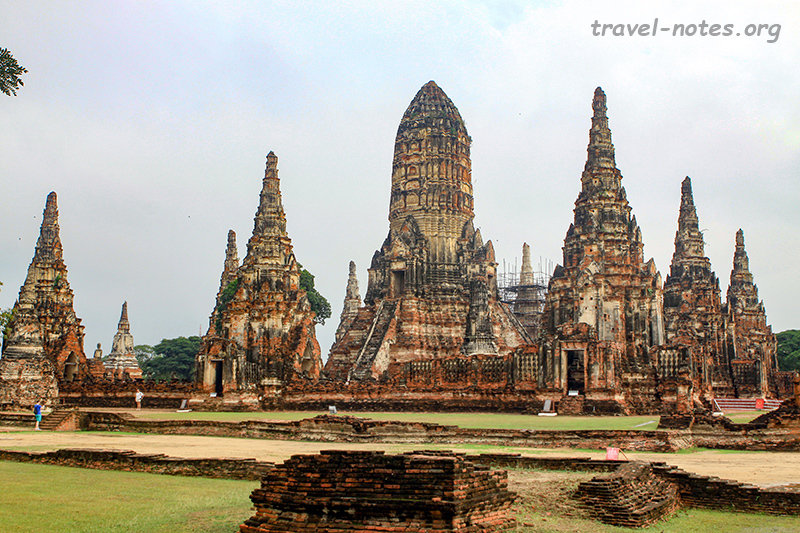 The day long drive finally bought us to our destination – Ayutthaya. The Kingdom of Sukhothai only lasted a century and it was soon engulfed by the Kingdom of Ayutthaya. Ayutthaya lasted 416 years till 1767 AD when it eventually fell to the fatal Burmese attack and most of the sites here are in the state the Burmese left it in and unlike Sukhothai, the city has continued to grow in and around the ruins making Tuk-Tuk the far safer and enjoyable option to get around than a bicycle. Unfortunately for us, an unseasonal storm greeted us on the morning at Ayutthaya. We tried to salvage something by visiting the museum which houses some of the impressive gold treasures recovered at a local temple. Around lunch time, the rain stopped giving us a glimmer of hope to rush through the laundry list of monuments – something a purist in me detests. My travel days are planned like a day of a Test Match where the most important events are the long lunch breaks, occasional drinks break and the non-negotiable tea break (Thai Iced Tea, in our case). It is now being reduced to a T20 bash. Just like IPL, the choice was limited: it is this or the soaps on the telly. As usual, I gulped my pride and went with the flow. Also, just like cricket where a batsman who struggles at 2 an over in Tests can suddenly waltz at 20 in T20, we somehow managed to pack in more in the half a day than we did in the entire day at Sukhothai. Wat Mahathat with its famed Buddha head stuck in tree roots: check; scrambling into the belly of Wat Ratchburana where the gold treasure was found: check; photographing the tall prang of Wat Phra Ram: check; gaping at the triplet of giant stupas at Wat Phra Si Sanphet: check; selfie with the array of lion statues at Wat Thammikarat: check; coming face to face with the 1500 year old Buddha statue at Wat Na Phra Meru: check; staring speechless at the astonishing Angkor style temple of Wat Chaiwattanaram: check; visiting the relatively modern white washed Wat Suwan Dararam: check; huffing and puffing up the gigantic stupa at Phu Khao Thong: check; craning your neck to see the gigantic 19m tall gold Buddha statue at Wat Phanan Choeng: check; trying to get all of 7m long reclining Buddha in one frame in Wat Yai Chai Mongkhon: check. Phew, it was tiring to just type these out! The only thing that brought a temporary pause in midst of this sprint was a mesmerising chanting in Phanan Choeng. Walking around the giant Buddha while the whole building was reverberating with the synchronised chants of a couple of dozen monks was one of those priceless moments that only travelling can offer. Oh yes, we atheists are also capable of having a moving experience. We just attribute them to Dopamine, Oxytocin, Serotonin and Endorphins. As Buddha would have said, the explanation is all within you! After an underwhelming dekko at the Bang Pa-In Palace, we reached Bangkok. 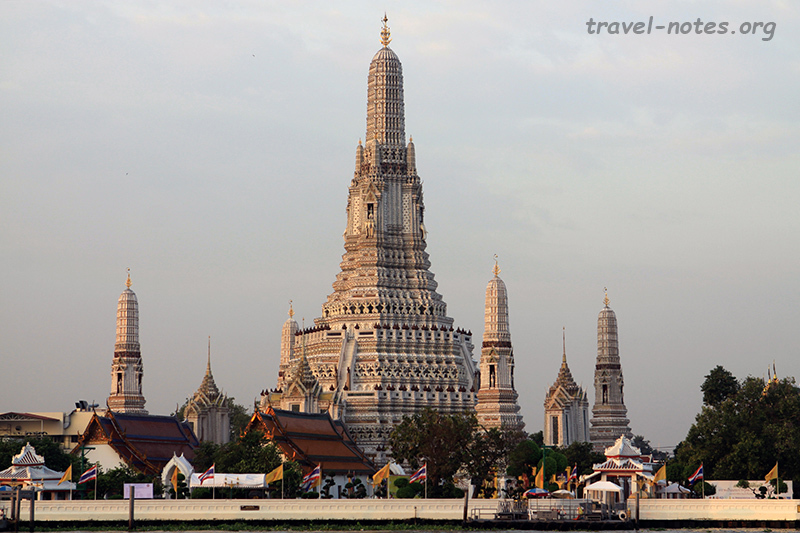 Our hotel was bang opposite to Wat Arun and one sight of the temple was enough to convince us to start our city sightseeing there. After a quick lunch, we took the ferry to the temple. Its famous 82 m high prang was constructed in the 19th century and is decorated with broken porcelain shards that the Chinese ships used to offload in the harbor. We then headed to the Royal Barges National Museum and made the mistake of searching for it from the land side. The journey involved going through a most confusing maze of narrowest of alleys. Only when we reached the museum did we realise that the smart way to reach a museum of Barges is from the water-side and that is how we exited it to head to Wat Traimit. Traimit houses one of the most stunning piece of sculptures on the planet – a 3m tall 5.5 tonne solid gold Buddha. If there is a Wimbledon of statues, we would love to see this one go against the Pieta in the finals. After enjoying a bird’s eye view from the top of the Golden Mount and hunting for trinkets, we got back to our hotel, which on the land side is bang opposite to Wat Pho (not to be confused with the common Vietnamese restaurant name: What the Pho). We, naturally, spent the evening at the temple gaping at the 46 m long (and 15m high) reclining Buddha and getting lost in the maze of colourful chedi made more brilliant by the rays of the setting sun. The following morning, we headed to the Grand Palace at its opening time to get a glimpse of the famous Emerald Buddha before the crowd got in. Rest of the morning was spent at the National Museum where the gleaming golden chariots parked in the Royal Garage, predictably, dazzled us. After a quick lunch, we headed to check out the lesser known attractions, first of which, Dusit Palace, greeted us with a “No Entry” sign as it was under renovation. The second, Suan Phakkad Palace Museum more than made up for the disappointment. It has to be one of the unknown gems of Bangkok. 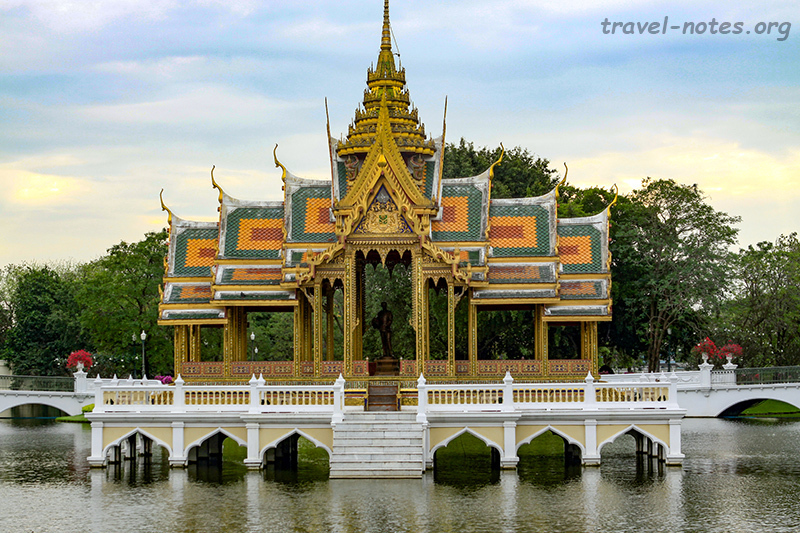 It houses traditional Thai buildings collected around the country and its Lacquer Pavilion covered with wall to wall lacquer work is simply breathtaking! The last stop for the day was the Jim Thompson House, a tastefully decorated traditional Thai house that Jim built for himself in the 1950s. His claim to fame is that he introduced the world to Thai Silk and disappeared mysteriously in Malaysia spawning many conspiracy theories and Bestsellers. On the final morning of our trip, we headed to Kanchanaburi, home to the Bridge On the River Khwae – note that “kwai” means buffalo in Thai, if you want to correctly pronounce the river’s name, you should sound like a 80 year old clearing his throat while simultaneously throwing up. The bridge, of course, has a dark history. It was part of the infamous Burma-Siam railway line, construction of which was done in most appalling of conditions costing close to 100,000 lives. The original bridge was destroyed by the allied bombing and what you see today is a reconstruction. An hour north-west of Kanchanaburi is Erawan National Park, whose primary claim to fame is a series of cascades, some of the most picturesque on the planet. A 2 km trail, about 3 hours to go up and down, takes you past all the official seven levels of falls and some of the impressive unmarked levels in between. The trail is a stroll only till about the half way point till the Level 4 and after that, it quickly devolves into scrambling up boulders and wading through the waters. Nevertheless, it is quite rewarding to pursue it till the end. That, ladies and gentlemen, is how you spend a week in Thailand and get nowhere near a beach, a task even a James Bond finds impossible to achieve. By the by, did I say that was our final day? That’s because I want to forget the real last day of the trip – the day of the return journey where somehow the Airline Industry Consortium manages to squeeze out every single positive thought accumulated over the trip. “Our sincere apologies for this delay” – my foot! Click here for more photos from Bangkok. 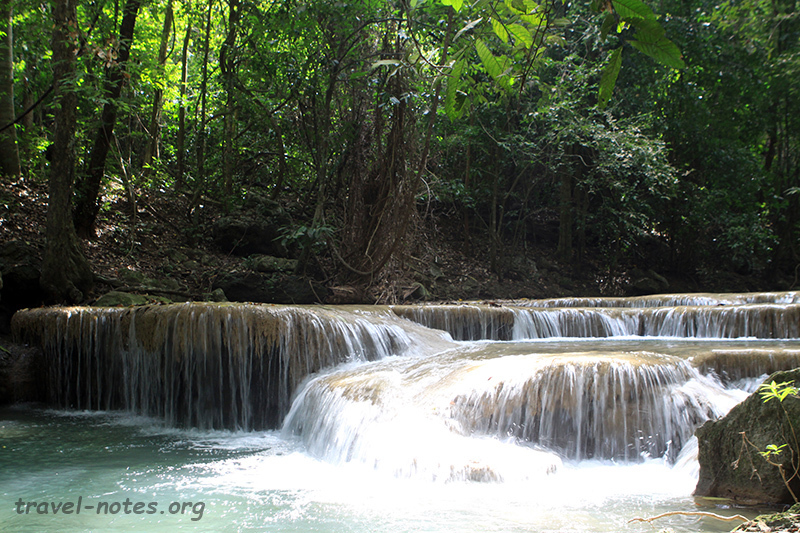 Click here for more photos from Chiang Mai, Lamphun, Lopaburi and Kanchanaburi. Click here for more photos from Sukhothai, Si Satchanalai and Kamphaeng Phet. Click here for more photos from Ayutthaya.